The never-ending saga of the Greek debt crisis appears to be finally entering its final phase this week. After 5 months of negotiations, Greece’s creditors, led by the IMF, have made a final offer to the Greek government, and it is an offer of more of the same – i.e. austerity. For its part, the Greek government needs to make a decision before Tuesday next week when it is expected to run out of cash. For those that have seen the headlines, but have not had the time to dig into what is actually happening in Greece, first a little background. 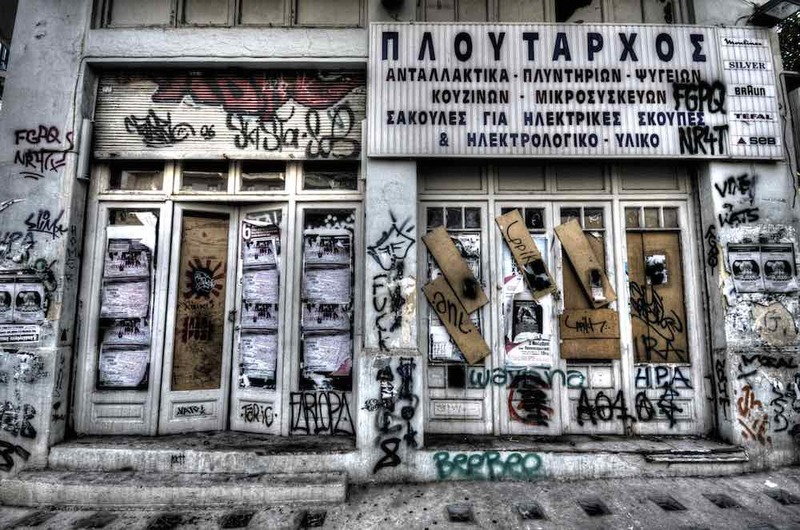 As early as 2010, it became clear that the Greek government was in trouble financially. It was running large deficits and was quickly accumulating a debt that bond markets increasingly believed were unlikely to be repaid. As a result, the yields on Greek Government bonds (the rate of interest that the Greek government has to pay to borrow money) began to spike, further increasing the risk that Greece would be unable to repay its debt. To avert a crisis, the IMF, the European Commission and the European Central Bank (“the Troika”) provided loans to the Greek government to help pay off their existing debt. By doing this, these organizations essentially took the majority of Greek government debt off the books of a range of mostly German and French banks, and put it on their own books. However, in exchange for the provision of these loans, the Troika insisted that the Greek government implement a series of measures to improve the budgetary situation. These measures mainly consisted of cuts to the public service and pensions, but also tax increases, and other measures. Generally these measures are referred to as “austerity measures”. Despite the warnings of many prominent economists that cutting government spending in a recession would cause further damage to the Greek economy, the measures were pushed through – as they were in a range of other countries. Sadly, the warnings provided proved accurate. By January 2015, the Greek economy was suffering from 25%+ unemployment and GDP had fallen 25%, far more than had been forecasted by the Troika at the outset of austerity. As the economy shrunk, so did government revenues and so further cuts were required to try meet the surplus target. In January this year, the Greek people tired of years of crushing austerity, elected what has been called a ‘far-left’ government. Syriza, a party that for most of the recent past had been attracting less than 10% of the vote, was all of a sudden front and center, and with a clear mandate to renegotiate and bring an end to austerity – but also to keep Greece in the Eurozone. After 5 months of increasingly bitter negotiations between the Syriza government and the Troika, and with the deadline approaching (Tuesday next week), there were two final offers made. For their part, the Greek government proposed a range of austerity measures that more or less met the Troika’s demands in terms of net budgetary impact. The difference was that they proposed smaller cuts to pensions with the gap being made up with a range of tax increases. Hilariously, the proposed measures were rebuffed over concerns it would hurt the growth of the Greek economy. The Troika then made their final offer to Greece. Even after all the evidence of how destructive and counterproductive austerity, the offer was basically the same as the original demand. Many took this as a sign that the Troika are aiming to force Syriza out of government, or Greece out of the Eurozone. What happened next appears to have caught most observers by surprise. On Friday night, the Greek Prime Minister Alex Tsipras announced he would take the final offer to a referendum to be held on July 5th. Although this is sure to further aggravate the Troika (if that is even possible), this would actually appear to be a very clever move on the part of Syriza. The biggest issue for Syriza since their election has been how they would manage to maintain their two key promises – to stay in the Eurozone and bring an end to austerity. After 5 months of failed negotiations, they have almost certainly proved beyond doubt that the Troika are not going to give any ground on austerity. By calling a referendum, they force the Greek people to choose what they want more – Eurozone membership or the freedom to run their own economy. Either the Greek people willingly accept further austerity in exchange for staying the Eurozone, or they accept exiting and take their chances on their own. What Happens if the Greeks Choose to Exit? No one knows for sure – but it won’t be pretty. Essentially, a chain of events will mean Greece will need to revert back to their own currency (essentially a new Drachma), which in itself leads to further impacts. The first and most serious of which is that the Greek government would need to impose capital controls – basically stopping people from moving their money out of Greece. In anticipation of this measure, Greeks have been pulling Euros out of Greek banks at a record pace the last few weeks and either moving it offshore, or effectively stuffing their mattresses. After the announcement of the referendum, the pace further quickened with pictures flooding into Twitter of lines at ATMs on Saturday morning and reports that many ATMs had already run out of cash. Looking further forward, after the change to a new currency, there is an expectation that it would depreciate very quickly against the Euro. As a result, vital imports like oil and medical supplies would suddenly become hugely more expensive causing problems in the health sector as well as for business in general. On the flip side, this depreciation should provide a boost to Greek exports (primarily tourism and agriculture). However, it is questionable how much benefit this can provide given the large internal devaluation that has already occurred. The only possibly good news is that the Greek government is already running a primary budget surplus (surplus before the costs of borrowing are included). By defaulting on its existing debt, it would not need to issue new debt to meet payment obligations in the short run (although a depreciating currency could impact that). Longer term, by most measures, the Greek budget is actually in a strong structural surplus (i.e. if the economy wasn’t hugely depressed, the budget would be in a much better position than it currently is). If the Greeks could manage even a small amount of growth after leaving the Euro, they could find they are quickly running large surpluses. For the Eurozone, a Greek exit is no longer the risk to financial stability that it once was, but it could be a risk to political stability. If Greece does exit the Eurozone, there will be several countries monitoring the situation very closely. Spain, Portugal and Ireland (not to mention Italy) have all undergone differing levels of austerity over the past 4-5 years, and all have seen very high levels of unemployment and significant falls in GDP as a result. If (and it is a big if) Greece exits the Eurozone AND manages to keep the country from falling apart completely, these other countries may be tempted to do something similar. From there, the Eurozone project could completely unravel. And make no mistake; this would also be disastrous for the northern European economies, including Germany. Without the relatively unproductive southern European countries in the shared currency zone, the Euro would be expected to appreciate strongly, doing serious damage to Germany’s export driven economy and even more so to less efficient countries like France and Italy. This scenario has led to some speculation that the Europeans will try to make any Greek exit as difficult as possible – to deter other countries from exiting. But this strategy has its own political ramifications. Essentially the European Union would start to look like a union held together by the threat of economic ruin rather than goodwill and mutual benefit. At that point, the question becomes what kind of union does Europe really have? Even though the Greeks have declared their intention to hold a referendum to decide on whether they will accept the bailout conditions, they don’t actually have enough cash to survive until the referendum date. As such, they are asking the creditors to provide an extension for a few days to get to the referendum. Early indications are that they will be refused even this small extension (the creditors are really pissed off…). To do this would appear to be a dumb move politically and with very little gained financially, but it took a lot of dumb moves to get to this point, so nothing can be ruled out. If they do hold the line and deny Greece the extension, essentially everything gets moved forward. On Tuesday, assuming the European Central Bank stops providing liquidity (cash) to Greece’s banks, the Greek government would be forced to step in with a new currency and we will officially have the first example of a country leaving the Eurozone. The Greeks have put the gun to their collective heads and shown they are ready to pull the trigger. The only question left is will Europe stop them, or hand them a bigger gun? For further details of why a Greek exit from the Eurozone will not be a panacea to the countries woes, Greek finance minister Yanis Varoufakis actually provides one of the best explanations I have seen here. In fact, Varoufakis, who has a master’s degree in Mathematical Science and a PhD in Economics, has been very active on Twitter and his blog throughout the negotiation process, often taking to the public to deny claims of insults and walkouts. To my mind he has remained the perfect professional throughout this process. For Australians, there is also a personal connection to Varoufakis, who was senior lecturer in the Economics department at Sydney University for 11 years from 1989 to 2000. He also regularly provided commentary on the crisis (before being elected) on Late Night Live – a radio program hosted by Phillip Adams (is there anyone with a better voice for radio?). I highly recommending listening to an interview conducted just after Varoufakis was elected to get a sense of the man – and that most Australian of traits, self-deprecation. If anyone can point me to a policy that could reasonably be called far-left, I’d love to see it.